FAU men's basketball let a 13-point second half lead to slip away, losing to Florida State 64-59 at the Orange Bowl Classic on Saturday. The game was delayed twice due to issues with one of the rims, approaching nearly an hour in total. 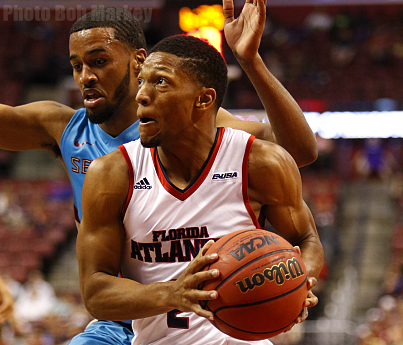 The Owls (2-9) led for most of the contest and more than held their own against the Seminoles. Marquan Botley (pictured) hit a free throw to put the Owls up 56-53 with less than four minutes to go, but the Seminoles, aided by back-to-back turnovers, closed on an 11-3 run to take the game. Botley’s 13 points led the Owls. He was joined in double figures by Ronald Delph (12), Jackson Trapp (11) and C.J. Turman (10). Delph’s 12 points were a career high. Turman added 15 rebounds for his third double-double of the season. Botley dished out two assists on the night, bringing his total on the season to 30 with only eight giveaways. This gives the junior a 4.75:1 assist to turnover ratio, which currently ranks second best in Conference USA. FSU (9-2) outscored the Owls 38-24 in the paint, including a 24-6 advantage in the second half. Trapp made three three-pointers on the evening, giving him 142 for his career, good for eighth place in program history. The Owls travel to Hofstra to play the Pride on Tuesday, Dec. 22 at 7:00 PM in their final game before Christmas.